To make the yuzu mayonnaise, combine the mayonnaise, green yuzu kosho and salted yuzu juice in a small bowl. To make the sushi vinegar, combine the vinegar, sugar, salt and kombu in a medium saucepan over low heat. Cook, stirring, for 2-3 minutes or until sugar and salt dissolve. To make the sushi rice, rinse rice under cold running water until water runs clear. Place rice in a large bowl and cover with cold water. Set aside for 35 minutes to soak. Place in a saucepan with water and place over high heat. Reduce heat to very low and cook, covered, for 10 minutes or until water is absorbed and rice is tender. Remove from heat and set aside, covered, for 10 minutes. Transfer rice to a large bowl with 225ml of the sushi vinegar and Perfect Ceylon Tea leaves. Use a spatula to carefully fold vinegar mixture through the rice, fanning with spatula occasionally. Continue folding until well combined and rice is sticky. Use a small knife to cut down the back of the prawns, not cutting all the way through, to butterfly. 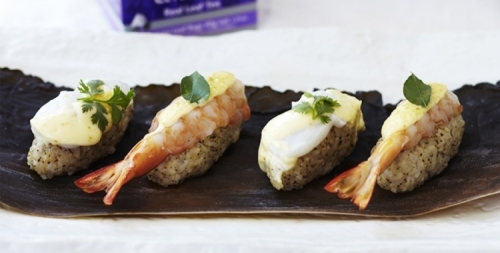 Using wet hands, shape tablespoonsful of sushi rice into oval shapes. Top with prawns and scallops. Spoon a little mayonnaise mixture over each sushi. Arrange on serving plate and top with cervil leaves.